Description: Erect or spreading shrub mostly 0.5–3.5 m high; bark curling off in narrow strips (‘Minni Ritchi’), reddish brown; branchlets angled or flattened, ± appressed-hairy. Phyllodes straight or slightly curved, subterete to ± flat, 13–18 cm long, 0.5–1 mm wide or sometimes broader, with appressed long fine hairs mainly between the veins, longitudinal veins obscure or several more prominent, apex acute; 1 small gland at base; pulvinus < 2 mm long. 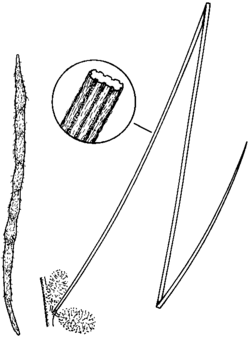 Inflorescences 1 or 2 (rarely up to 4) in axil of phyllodes; peduncles 1–2 mm long, finely hairy, often obscure or flower heads ± sessile; heads ± ovoid, 0.4–1 cm long, 17–27-flowered, bright yellow. Pods ± straight, ± flat except slightly raised over seeds, ± straight-sided to slightly constricted between seeds, 3–8.5 cm long, 2–3 mm wide, papery, moderately to densely covered in silvery, silky hairs; seeds longitudinal; funicle expanded towards seed. Distribution and occurrence: Bourke area south to the Hillston-Lake Cargelligo area; rare. Grows in Acacia shrubland and mallee, often on rocky outcrops. Named after Rev. John Michael Curran (1859-1929). May be confused with Acacia burkittii which differs in the details of the bark, phyllodes and flowers. A broad (to c. 4 mm wide), flat phyllode variant of A. curranii occurs east of Hillston.